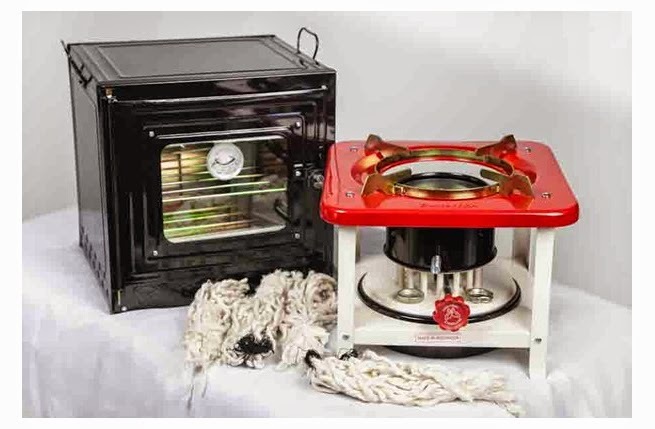 We were so happy with our Butterfly Kerosene stove, we thought we'd give their stovetop oven a try. The nice folks at St. Paul Mercantile were happy to ship us one (these are great people with which to deal, btw. ), and we thought we'd give you a first look at our first few experiments. Based on some reviews we'd seen, we opted to spend the extra $10 bucks and let St. Paul Mercantile assemble the thing for us. Looking at the assembly, that was a good choice. Don't make yourselves crazy, let them do it. The oven showed up well packed, intact, and solid looking and two days earlier than we'd expected it, a good omen. Butterfly Oven with Butterfly 16 Wick stove as sold by St. Paul Mercantile. Let me say up front that we've already done quiet a bit of baking while on the boat, but almost all of it dutch oven cooking outdoors. With the nasty weather of late winter, we began to wish we had another option to the--admittedly delicious--largely one pot meals that had been our staple through most of the winter. Hence the oven. The oven is basically a black box, similar in form to the folding "Coleman" camp ovens that you may have seen in the past, but far more stoutly made. The critter does NOT fold, and has an open base and some substantial heat reflectors on the interior. 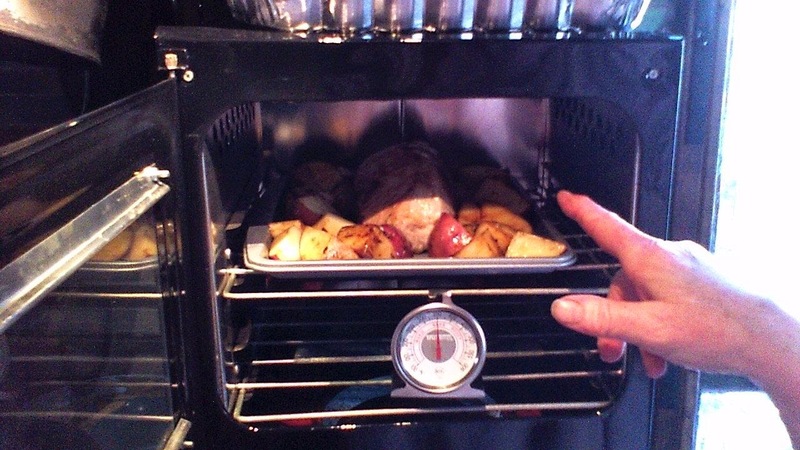 The original edition of the oven does not have heat resistant glass in the front, as some users have commented. The folks at St. Paul Mercantile found an outside source and retrofit all theirs with heat resistant glass. This thing is really solid, with a centigrade calibrated thermometer mounted in the front of the glass. 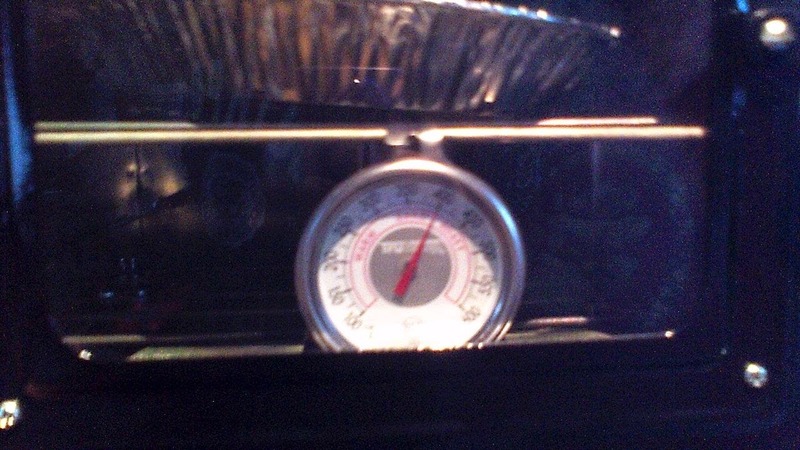 It became pretty apparent on our first try out that that thermometer was wildly inaccurate, and we easily removed it and substituted a calibrated Fahrenheit scale oven thermometer in its place. Balancing the temperature takes a bit of practice and attention, but once you get it down, it works well. Ovens of this type are essentially inverted reflector ovens. They don't have a lot of insulation, heat up quickly, and cool down just as quickly. For a boat, both of these are a plus. 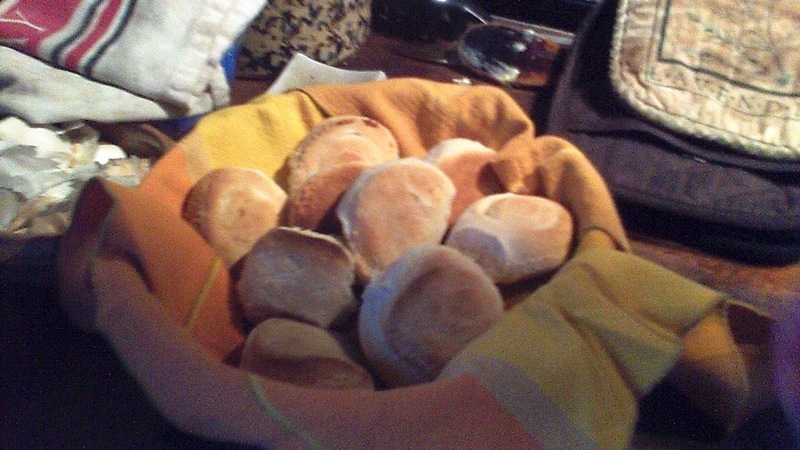 In our first outing, some commercial biscuits, it became apparent that keeping the temperature even is a bit of a challenge and takes some attention and practice. By the time we tried cooking anything serious, though, we rather had it down. Roast in the oven. High temps are no challenge at all with this thing. 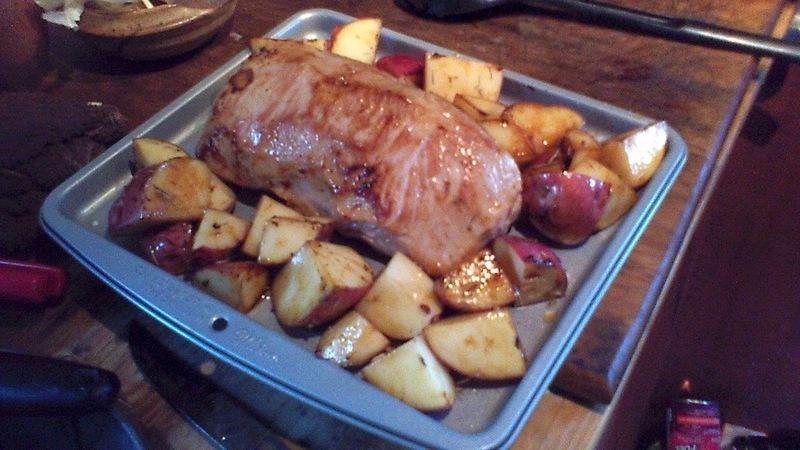 This is a lovely pork roast with potatoes and a plum sauce, which was our first major meal in the oven. It turned out beautifully, as you can see. Left overs? Are you kidding? We may have eaten the pan as well, we're not sure. All in all, this is gonna be a GREAT addition to our galley. Ovens like this one come with a few challenges, aside from the maintaining of even temperature. 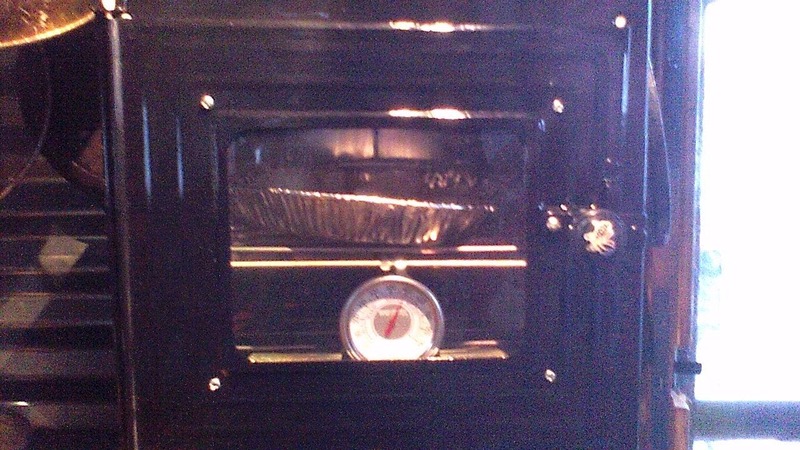 The 10.5 X 12" oven space was a bit of a puzzlement to find bakeware to fit. We were becoming frustrated until we noticed at our local Bed, Bath, and Beyond a section with cookware for toaster ovens, all of which fit perfectly, and were of very high quality. Do yourself a favor and look in the toaster oven section first. Since the unit does not break down, finding a storage space was a bit problematic, but the oven itself can be used for stowage when not in use. Two thumbs up guys, and the combination with Butterfly's 16 wick kerosene stove makes for a really easy to use, competent galley. More shortly. So happy to have the new computer up and running. Hey we'll be posting new stuff today and tomorrow to our other blogs at Life, Art Water and Onboard Cooking, so kindly stop by and check em out. Oh, and if you'd give a glance to our kind advertisers that make this site possible, we'd appreciate it.